Most people don’t realise that in all the national parks in South Africa (and elsewhere in Southern Africa) you can drive yourself in your rental car for less than US$25 a day (fee for a foreigner to get into the famous Kruger National Park) which makes for a cheap option for a full day’s activity. Check out the sightings board at each camp to help find animals or just enjoy the thrill of finding them yourself. You would be amazed how close you can get to the animals. 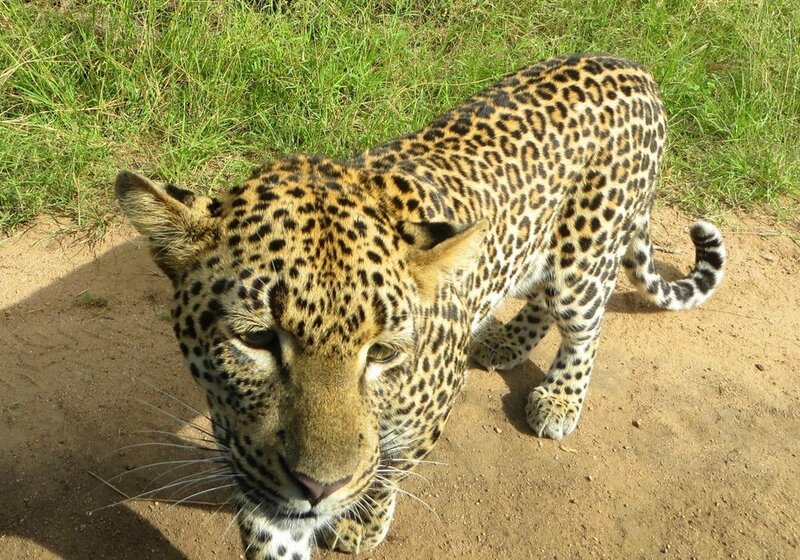 This young leopard came write up to our car window! For a really memorable safari go for a guided walk in a national park or a private reserve, with an armed park ranger. Walk through a secluded area of the bush. Track dangerous game, learn about the geology and flora of the area and discover a side of the savannah you usually drive past. If you don’t trust your animal spotting abilities then you can book and pay for a guided safari from the nearest camp. The advantage is that your guide knows the best places to find the animals, he/she will impart with their extensive knowledge with you, and you will be in an open safari vehicle. Expect to pay around US$25 + entrance fee for a 3 hour safari. For the best guided experience you should definitely stay in a private reserve. Self-drives are not permitted in private reserves and the number of vehicles at each sighting is usually limited to just 2. This will allow you to get the best views and photo opportunities with a highly qualified guide and the lodges are all of excellent quality. The reserves on the border of the Kruger National Park are the best for big cat sightings! Expect to pay a minimum of US$250 per night per person – Prices can go up to US$3000+ Prices include I night at the private lodge, 2 game drives, 3 meals and often unlimited soft drinks. For a unique safari, do it on horseback. Few lodges offer this activity but it gives for a memorable experience and allows you to get closer to the animals than on foot and without the barrier and sounds and smell of a car. Why limit yourself to dirt tracks when the best views are from the sky? 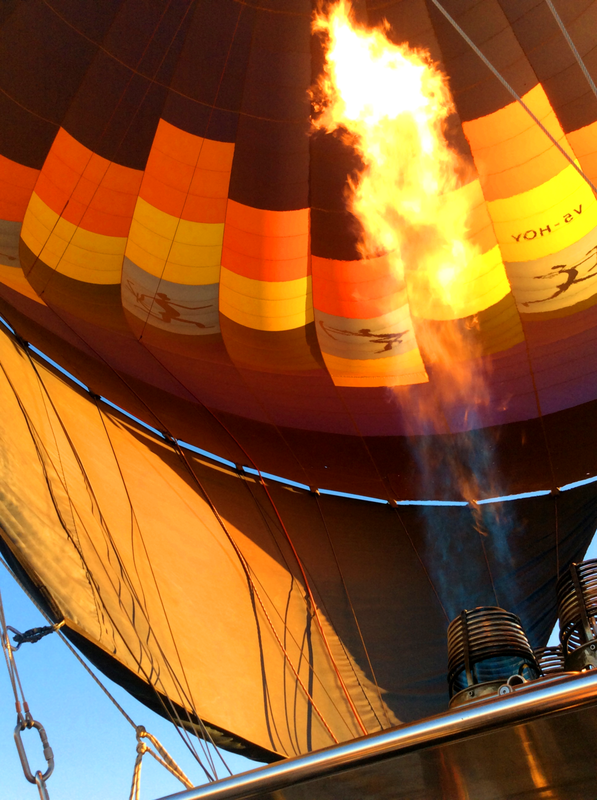 For an unforgettable experience, float over the African savannah in a hot air balloon and see the herds of elephants and journeys of giraffe from above. Only available in a select few reserves, such as Entabeni, Mabula or Kapama. Prepare to pay around US$300 per person. Stacey and Olivier are both tour and safari guides currently based in Namibia and travel around Southern Africa with their guests for a living. Originally from England and France respectively, they moved to South Africa in February 2014 to train to be safari guides and then moved to Namibia in 2016. Check out their blog https://followtheguides.com/ to find out what it is like to be a professional safari guide in Africa as well as loads of tips and tricks on travelling in South Africa, Namibia and Botswana.